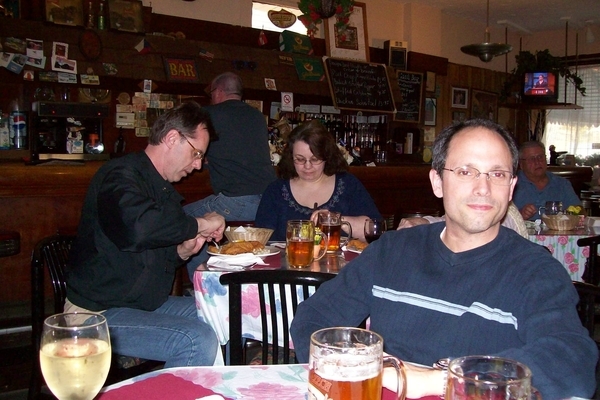 Marta’s is a tiny hole in the wall serving up good, homemade Czech food as well as Czech beer on tap since 1995. When I say tiny I mean tiny. There are maybe eight or ten tables in here and one wall is taken up by the bar. This is a local tavern in addition to serving up some great food. The menu features some American sandwiches as well as most Czech standards with your choice of the traditional bread dumplings or (more typically Austrian or Hungarian) Spaetzle. Other Eastern European favorites such as Wiener Schnitzel, pierogis, beef goulash, and chicken paprikash are standouts as well. All of the Czech dinners come with dinner rolls and your choice of tossed salad or soup. If you like tripe soup you can order it here. Marta’s also serves hamburgers, salads and sandwiches, and I’m sure they are very good as well. I just can’t bring myself to orde r anything but Czech food when I come here. If you are very lucky Svíčková will be offered as a special that day. Svíčková, or svíčková na smetaně (beef sirloin in cream sauce), is a typical and popular Czech dish. It is marinated sirloin prepared with vegetables (carrots, parsley root, celeriac and onion), spiced with black pepper, allspice, bay leaf and thyme, and boiled with double cream. 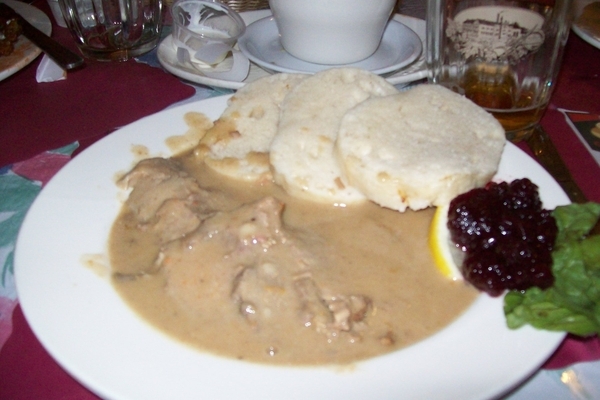 It is generally served with houskové knedlíky (bread dumplings) and cranberry sauce. I LOVE Svíčková. If you like creamy dishes, o nce you try it I guarantee you will be hooked. Marta’s chicken paprikash is also equally delicious. The chicken is tender and falls apart with your fork. The paprikash sauce is delicious. My date loved it. He ordered the spaetzle instead of the bread dumplings. The spaetzle were obviously homemade based on their irregular, inconsistent shape. They were perfectly cooked and light. 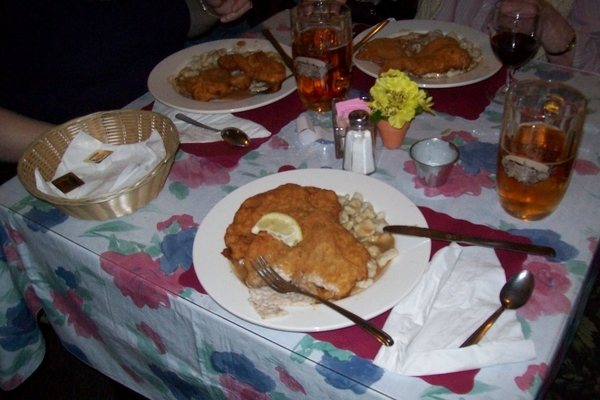 The Wiener Schnitzel was a very popular choice with several of my dining companions. The Schnitzel was pounded thin and lightly fried. A squeeze of the accompanying lemon slice is all you need to enjoy this authentic Wiener Schnitzel. 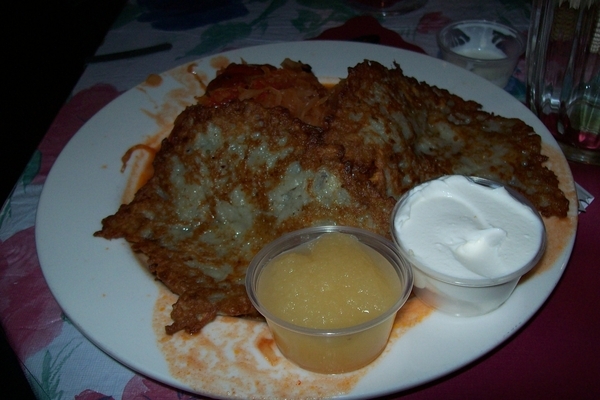 Another friend ordered the stuffed cabbage and potato pancakes, which were also a special that night. You can barely see the stuffed cabbage peaking out from behind the potato pancakes. The stuffed cabbage was a hit and the potato pancakes were not overly greasy. They soaked up the stuffed cabbage sauce nicely. The beef goulash is as quintessentially eastern European goulash as you can get. Slavic peasants created this stew using three basic ingredients: equal parts beef and onions, and a healthy dose of paprika. There are no veggies in this goulash apart from the onions, which have melted down. It is also not the American goulash/beef and macaroni version people grew up with. 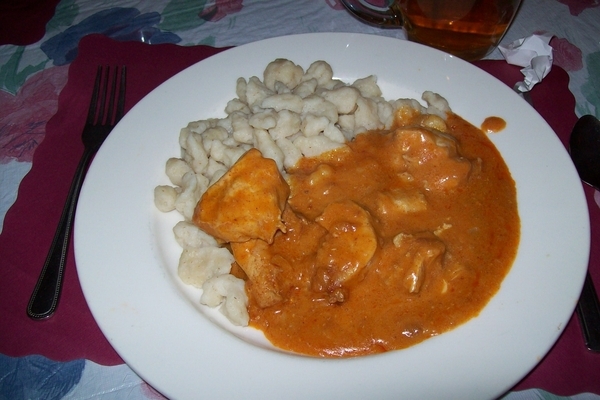 This is the goulash I was served in Austria when I studied abroad. My best friend made an amazing version of it. It features melt-in-your mouth, tender chunks of beef, slowly cooked in an incredibly rich paprika gravy. Marta’s Fish Fry on Fridays is also quite popular. She serves the Fish Fry every day during the Lenten season. 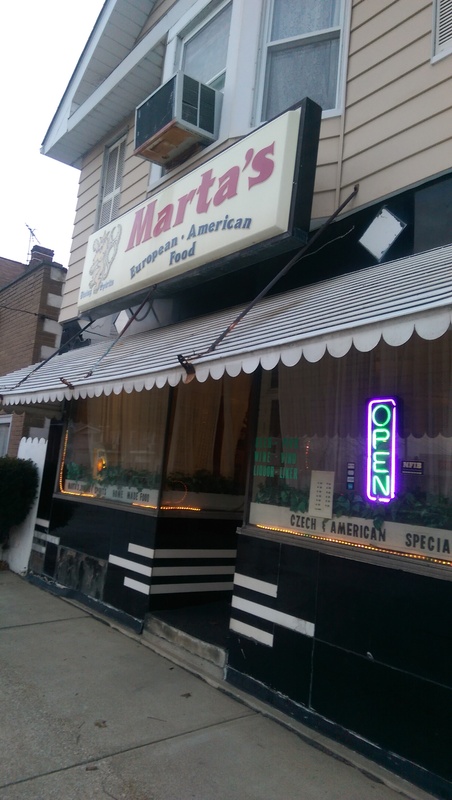 Marta’s is open for business Monday to Thursday from 4 pm to 9 pm, Friday 4 pm to 10 pm and Saturday 4 pm to 10 pm. 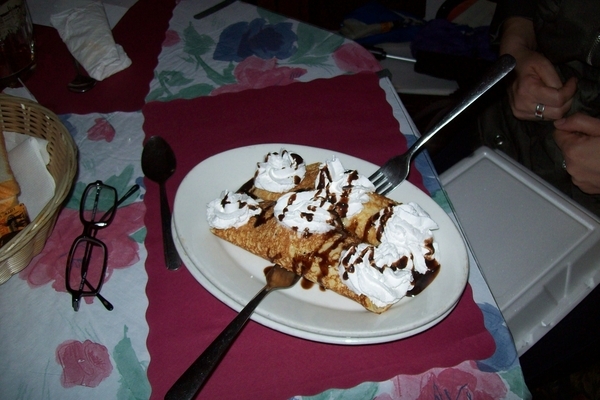 For dessert I highly recommend ordering the Palacinka, which is a crepe with fresh fruit filling and whipped cream. It is a light and perfect ending to a heavy meal. It is also a nice dessert to share, so save your forks. Marta’s also serves apple, cherry or cheese strudel and vanilla ice cream. One of these days I am going to see if they would be willing to combine the offerings and make my all-time favorite dessert – Eispalatschinken, which is palacinka filled with vanilla ice cream instead of fruit filling. I ate this for the first time in Austria 25 years ago and went back to the restaurant 10 years later and enjoyed it again.